I live in Wisconsin and I set my beekeeping mysteries here too. It's fun sharing facts about my state. Wisconsinites haven't been taken seriously by the east coast or the west coast. Even though we had Jeffrey Dahmer and Ed Gein (serial killers). They should have put us on the map, maybe not in a good way, but still.... Or at least Lawrencia Bembenek (Go, Bambi, Go) should have. We also have lots of breweries (the most famous being Leinenkugel, New Glarus, and Miller) and more taverns that any other state. Wisconsin gave the world Liberace, Frank Lloyd Wright, Spencer Tracy, Georgia O' Keeffe, and Orson Welles. But what did it take in the end to get us some respect? THE PACKERS and THE WISCONSIN BADGERS and THE BREWERS. We're crushing the competition. Go Wisconsin! I also enjoy sharing the love of my spot in the world-Western New York. No-we're not close to NYC and yes there is a lot to see and do here. (I admit-I've never been to NYC.) We have beautiful scenery, a wonder of the world (Niagara Falls), tons of history (including graves of Susan B. Anthony, Frederick Douglas, Millard Fillmore, and a Jack the Ripper suspect), incredible wineries, and wonderful architecture. Although I hate the taxes of New York state-I'm proud to live in WNY. Go Bills! Got to admit, I did cheer for Wisconsin when they played Nebraska. Of course I'll cheer for anyone that plays and beats Nebraska. That way maybe by time we (Iowa) play them they will have all that bull out of them and we can beat them to. I'm not a through and through Iowa fan, in fact, I am a Tennessee transplant so I actually still bleed orange. My daughter wants to move to Wisconsin because she likes your accent. I've been to Niagara Falls. It rocks! And Sue - I have an accent? LOL. How come you are all loving sports nowadays? I have friends who are retiring to Wisconsin but personally I'm heading south when the time comes to leave PA. As a native Illinoisan, I'm a Bears fan so you know what my opinion of the Packers is. :( I must admit the dog in the picture is absolutely hilarious though. Yeah, Wisconsin is kicking some sporting butts these days!!! It's getting to the point where I don't know what t-shirt and baseball hat I should be wearing... Monday was a Badger shirt, yesterday a Packers shirt... today... the Brewers!! Deb, we have to celebrate now while the sporting gods are smiling on Cheeseheadland!! ALL OF THE ABOVE!!! Go Wisconsin!! YAY Wisconsin! 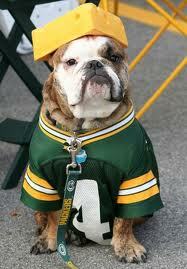 Let's hear it for Cheeseheads! I have a good friend from Wisconsin so I'm rooting for the Brewers! I lived in Appleton as a child and returned to Madison for grad school. I've lived in Georgia for 18+ years, but I'm still cheering for the Packers and Badgers!